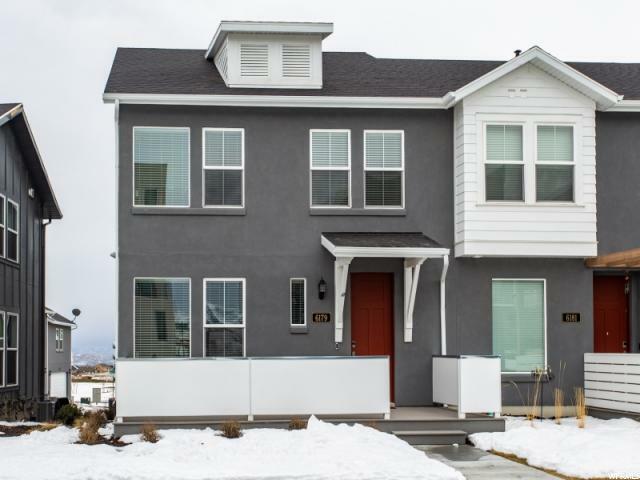 All DAYBREAK HIGLAND PAR homes currently listed for sale in South Jordan as of 04/21/2019 are shown below. You can change the search criteria at any time by pressing the 'Change Search' button below. "Save yourself the hassle and build time of new construction and get in to see this nearly new townhouse. This charming home sits in Daybreak's sophisticated Highland Park village and is move in ready. Only one owner who has taken meticulous care of this cozy home. You will find tasteful decor and beautiful finishes throughout.The open upgraded kitchen features Quartz counter tops, stainless steel appliances, a gas range, and pantry. The Master bedroom is complete with vaulted ceilings and double sinks. The large 9'X22' deck is the perfect backdrop for outdoor entertaining. Highland Park amenities include: community pool, coffee shop and bakery, community park 1 minute away, and walking/biking trails. If walking to the neighborhood cafe to grab a morning chai is your thing, or enjoying the many summer close by activities such as hiking, kayaking, paddle boarding, or fishing, this is a place you could call home. Conveniently located 5 minutes away from the Trax train system as well as Oquirrah Lake. "